Over the last few years, one of the strategies I have used to green my lifestyle is to switch from single-use disposable products to reusable ones. In addition to trimming my trash's waistline significantly, these changes have reduced my family's exposure to toxins and saved me buckets of money. Here are 6 switches I've made that you can make too! Goodbye, Paper Napkins and Towels. I still keep a roll of paper towels on an upper shelf in a kitchen cabinet, but probably only go through two or three rolls in a year. Switching to cloth napkins and towels was not nearly as painful as I thought it would be. First, we switched to cloth napkins. When we ran out of paper napkins, I simply dug the cloth napkins (wedding gift) out of a bin in the garage instead of buying more paper ones. Then I stocked up on some fabulous sponges and plenty of kitchen towels, and made sure to stash them in convenient locations. You can read more about my switch to a paperless kitchen here. This was a tough one. And it took me a while. But little by little I have found a new way to store virtually everything I once stored in disposable plastic baggies. I now have a stash of snack, sandwich, and gallon-size reusable food bags in food-safe fabrics. The double-nylon ones work great in the freezer and for partially used blocks of cheese in the fridge. Many other items are now stored in glass jars or cardboard boxes instead. When I do need a plastic bag (to freeze a loaf of homemade bread, for example), I have a stash of plastic bags from other food packaging (tortillas, for example) that I store in an empty tissue box that I can reuse. 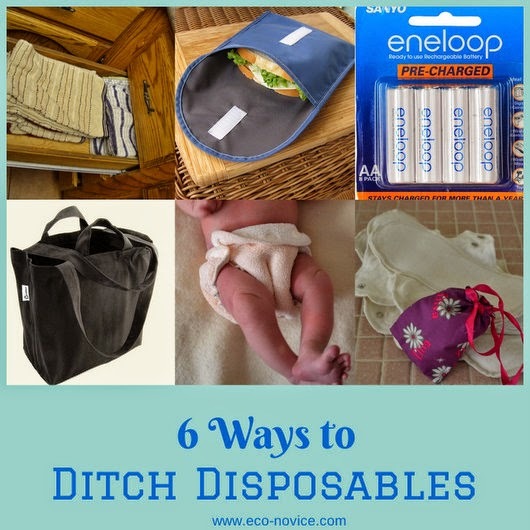 Click here to read posts about my experiences saying goodbye to disposable food baggies. If you have a lot of electronics, it probably makes sense to invest in rechargeable batteries. My husband led the charge on this change, partly because he was tired of storing used batteries indefinitely in the garage until we found a way to appropriately dispose of them. (Batteries are hazardous waste and should not be discarded in the regular garbage.) After trying several different brands (the very inexpensive ones were mostly duds with a frustratingly short life), we found a high-quality reliable brand that we really like. In the beginning, I reused plastic shopping bags. But I often forgot them, and ended up with more, and they just seemed to multiply like rabbits. Then I reused paper bags, but often overloaded them and broke the handles. They rarely lasted more than a few trips. Next I moved onto the 99 cent reusable variety. I found they didn't last that long either and also read that they could be made with questionable materials. Finally, I invested in some high-quality fabric shopping bags (made of recycled cotton and plastic). This is what I would recommend you do if you are serious about reusing your shopping bags. I also love using reusable produce bags (I often get asked about them when shopping). We always put our shopping and produce bags back in the trunk after returning from the grocery store or farmers market. You can read more about my favorite reusable shopping and produce bags in this post. Nothing inspires consumption like a new baby. I remember well how my garbage can overflowed each week with disposable diapers. We literally could not fit all of our garbage into the can given to us by the city. Even more important, I had concerns about the disclosed and undisclosed ingredients of disposable diapers, and the effect of their being in contact with my baby's sensitive areas 24-7. I switched to cloth diapers and wipes when my first child was one and have never looked back. My newborn diaper stash has been used by 5 different babies (only two of my own), and I just lent them out for a sixth round. Actually those diapers have been used by even more babies than that, since I purchased them second-hand. That's some serious reuse! I have also enjoyed using reusable nursing pads while breastfeeding my kids. For more information about cloth diapers, check out my page Everything Eco-novice Knows About Cloth Diapers. My latest foray into reusable products pertains to everyone's favorite topic: menstruation! First I switched to non-toxic tampons and pads made with pesticide-free and bleach-free organic cotton. But eventually, after hearing all my green friends go on and on about it, I switched to a menstrual cup. Even if you aren't ready to try a cup, consider cloth pads. I use cloth liners as backup with my cup and they are so much more comfortable than the paper and plastic disposable pads and liners. Plus, no adhesive (need I say more?). Read more about my recent (and long procrastinated) switch to reusable menstrual products here. Reuse is Better than Recycling! Recycling is a great way to reduce your waste, but remember that even better than recycling is reuse. Recycling requires energy (much of it is shipped to China for processing), not everything you toss in your recycling bin ends up recycled (because of contamination and other issues), and even what ends up recycled is usually down-cycled, not recycled into the same product. Switching to reusable gift wrap, water bottles, milk bottles, and returning berry baskets and egg cartons to producers will reduce your recycling and conserve resources. Always be on the lookout for ways to reduce your waste and recycling by reusing! What are your favorite reusables? What disposables have you had trouble ditching? Would you like more ideas and tips about Going Green Gradually? Sign up for my free email subscription to get each of my posts delivered to your inbox (I usually post one or two times a week). You can also follow me on Facebook, Google Plus, Pinterest, Twitter, or with your favorite RSS Reader. I hope to see you again soon! Disclosure: This post may contain affiliate links. Your purchase via these links helps support my blog. Thank you for your support. Read my full disclosure policy here.